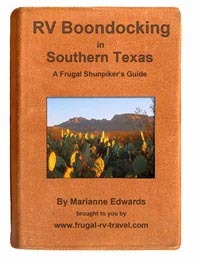 Guide lists free RV boondocking and tent camping locations in Southern Texas; good directions and GPS co-ordinates; hiking suggestions and other affordable adventures. We're two Canadians who spend winters in sunny Southern Texas for less than $250.00 per week. With a climate much like Florida's, south Texas has not yet been overdeveloped. Free camping, right on the beach, and in other scenic locations can still be found here. I'm sharing all our personal free camping finds of the past 10 years of shunpiking (driving the back roads) through Texas. A Texas map shows you at a glance the suggested routes and where you'll find the listed free camping locations. A detailed one-month itinerary for the most popular South Texas destinations: Follow it, take advantage of the free camping suggestions, and spend less than $110.00 in camping fees for the entire month. A camping accessibility Index: A quick reference for all 80 suggested frugal camping areas listed in the guide shows whether a tent can be set up and what size of RV can easily access each site. Half of the 80 suggested campsites listed in this guide are suitable for tents as well as RVs. Hiking suggestions: We love to hike so we've also listed some of our favorite Southern Texas hikes. A bonus section: The Road To Texas. The majority of RVers who travel to Texas come from our part of Canada and The States (the northeast). If you're among them, you'll benefit from this bonus section that lists free camping areas and our favorite stops en route to Texas.